I really did like the first part of SNL tonight (9/22/12) with Joseph Gordon-Levitt and Mumford & Sons, notwithstanding the weak opening. Who can possible mock Kelly and Michael Strahan? At the very least, please take note that Michael has no lisp. If you're going to impersonate, at least get it right. Moreso, SNL needs better writers for black comics. I kinda like Jay Pharaoh (really like Keenan), but weak writing is gonna get him shipped off mid-season. After Weekend Update and the 2nd Mumford performance, the rest of the show fell apart. Disaster. Up till then, we had some good sketches and commentary, including the GOB Tampon 'commercial', and JGL channeling his inner Muppet "Sam The Eagle" for his Tommy Bergamont Master Hypnotist sketch. I really do think Vanessa Bayer (Assad's Two Best Friends) could become Seth's co-host. She has good timing, good energy, and doesn't seem to be trying too hard. Normal price: $178.00. Clearance price: $69.97! I got my Suckadelic Rejects 2 figure in the mail a few weeks back, and I finally figured out the parts-mix: "the same bootlegged suit from the Occupy Cybertron line, coupled with the infamous Sucklord helmet." The"production" version is the Sucklord Host 2012, commemorating his duties at the Designer Toy Awards during NYCC. Instead of the Clutter Magazine paint scheme though, mine is all silver, except for the black tie. Minor paint splatter on the bubble. AVOID. Here's a free sales tip: don't insult your customers. Customer service = sales. My wife and I were shopping for a pair of polarized aviator-style sunglasses here today and had the most unfortunate service experience! The guy who helped us was SARCASTIC, RUDE, AND UNPROFESSIONAL. He even admitted he was being sarcastic! 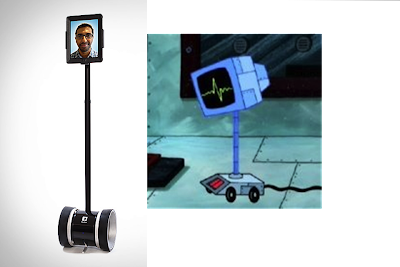 Double Robot Related to Karen Plankton?